It is a special day for our Louise! March 1st is St. David's day, the patron saint of Wales, who was born on a cliff top in Pembrokeshire during a violent storm, and where he landed a spring came which is now St Nons Well. St. David led a frugal life, eating mostly watercress, and encouraging leeks to grow. 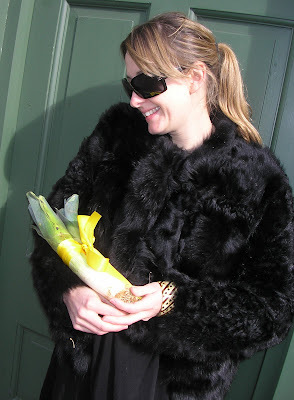 Louise is also from Pembrokeshire, and here she is in her Black Welsh Mountain coat, with her leeks decorated in yellow satin ribbon.